3rd meeting of the National Anomaly Committee was held yesterday, i.e. on 15th February, 2011 under the chairmanship of Secretary(P), DoPT(Government of India), wherein the following deliberations were made. Though we know that no substantial relief has been given, but we hope for some outcome in the meetings likely to be held in future. Two issues which are very important from our point of view - one is increment from January for those who falls between February and June was virtually rejected by the Ministry of Finance(Expenditure) but yesterday we again raised this issue, and after prolonged discussions, the Secretary, DoP&T had agreed to review the matter. An indication has also been given that if Staff Side agrees for one time exemption, then the issue can be resolved. We also raised the issue of MACP Scheme, particularly abolition of GP Rs.2000. The Jt. Secretary(Estt.) stated that we would hold another round of discussions before finalizing the issues related to MACP Scheme. During my opening remarks, though it was out of agenda, I raised the issue of early finalization of items of Departmental Anomaly Committee which are pending with the MoF(Exp). I stated that the Departmental Anomaly Committee of Railways had sent unanimous recommendations on various items to MoF(Exp.). More than nine months have passed and these issues are still pending with the MoF and the Railwaymen are feeling lot of frustration and therefore these need immediate redressal. Though orders for Cadre Restructuring have been issued by the DoP&T vide O.M.No.35034/9/2010-Estt. (D) dated 10th February, 2011, we raised the issue that Matching Savings is not possible in the case of Railways. The President/AIRF and Secretary, NC/JCM(Staff Side) also emphasized on the issue and stated that in the Safety Categories, Railways cannot give Matching Savings. Therefore, for Cadre Restructuring, Matching Savings should not be insisted upon. It has been agreed by the Jt.Secretary(Pers.) that if reference comes from the Railways, that would be considered favorable. Apart from the above issues, we also discussed agenda items which were not discussed so far in the National Anomaly Committee. Item No.11: Grant revised allowances w.e.f. 1.1.2006 - Staff Side will give list of allowances. Thereafter, it will be discussed. Item No.12 & 13: Transport Allowance - Staff Side will supply details. Thereafter, it will be examined. Item No.14: Revision of existing allowances which are to be withdrawn and replaced by new schemes - If Insurance Scheme is not finalized within six months in consultation with the Staff Side, Risk Allowance and Patient Care Allowance will be doubled. Item No.20: Daily Allowance on tour: - Orders have been issued for Geological Survey of India and Ground Water Board. Item No.28: - Grant of GP Rs.5400 in PB-2 for Astt. Accounts/Audit Officers - Will be taken-up separately with the Jt. Secretary(Pers.) and Estt. Item No.31: Child Care Leave in respect of Central Government Women Employees as a result of Sixth Pay Commission report - It will be looked into for Defence Employees. Item No.37: Waiver of recovery of higher DA/DR drawn during the period from 1.1.2006 to 31.8.2006 - Not Agreed. Item No.38: Anomaly in fixing grade pay -Deferred. Item No.39: Anomaly due to not applying uniformly the multiplication factor of 1.86 in fixing the minimum pay in all the revised pay bands applying different - Unresolved. Item No.40: Grant of notional increment as may be due on the first day of July following the superannuation/death in service for computation of emoluments/average emoluments for pensioner benefits - Not Anomaly. Item No.41: Fixation of pay on promotion to a post carrying the same grade pay - Staff Side stated that the issue of Additional Allowance to the Running Staff has been raised. Where it has been emphasized that since DA has already been given on Additional Allowance, other benefits should also be given on Additional Allowance to give proper relief to the Running Staff. For other categories, e.g. ASM to SM in the same grade pay or MCM to JE in the same grade pay since their responsibility increases, therefore, in all fairness, and increment must be given while fixing pay. Official Side asked the Railways to submit the list, so that decision can be taken. Staff Side mentioned that since this issue belongs to Railways only, therefore, powers should be delegated to the Railways as has been done earlier. Official Side mentioned that since the issue has already under reference to National Anomaly Committee, Railways will be asked to submit the list. Thereafter, decision will be taken at an earliest. Item No.43: Anomaly in the pay scale/pay band and grade pay of Library Information Assistants - Already finalized. Item No.44 : Before the 6th Pay Commission, there were 3 HAG scales of pay - Under review. Item No.45: Anomaly in pension of those in receipt of stagnation increments in pre-revised pay scales - Official Side agreed to consider the cases where someone had stagnated beyond one year in the pre-revised scale. Item No. 46 and 49 - Disparity in pay scales and status of officers in stenographers cadre and Anomalies in the matter of pay scales of stenographers - Will be examined. Item No.50: Anomalies in the pay scales of official language staff - Since the issue of Rajbhasha Staff has been sent to Ministry of Finance(Exp.) Official Side agreed to send its approval at an earliest. Item No.51: Assigning higher grade pay of Rs.4600 to Administrative Officer Gr.III and Private Secretary in Subordinate Offices - Resolved. It is regretted that government has not resolved the case of individual’s whose annual increment falls between Feb 2006 to Jun 2006. This is a great loss to the individuals without their any fault. It is also intimated that State Governments have also implemented pay commission on the same line as announced by Central Government but they have fixed two increment dates on 01 Jan and 07 Jul of each year to avoid any anomaly on account of annual increment. Notwithstanding with all clarifications/discussion on this issue after implementation of sixth pay commission in fast, it is not understood why government is not accepting the legitimate bonafide demands of employees whose DNI falls between Feb 06 to Jun 06. (a) Remove the criteria of compulsory six months service as on 01 Jul 06. Now the individuals may opt increment first and than accept the sixth pay commission. In this process all will loose arrears upto their previous increment date, causing no extra burdon to the government. (b) Fix increment date twice in a year on the line of state government i.e. on 01st of Jan and 01st of Jul. 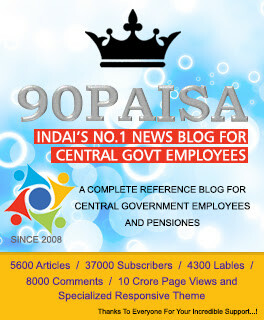 (c) Give one increment as on 01 Jan 2006 to all employees whose DNI falls between Feb to Jun 06 as a one-time measure only. In view of the above, May I request the staff side to defend the case on next anomaly committee strongly on the above lines. 1.Give one increment as on 01 Jan 2006 to all employees whose DNI falls between Feb to Jun 06 as a one-time measure only. (The above thing is correct,the Finance ministry should consider as humanity ground,OR THE FINANCE MINISTRY SHOULD CONSIDER DECEMBER RETIREMENT FOR ALL)Then all will get one increment before their retirement.Financial loss is very heavy if theY are not considering, it is obvious.Many of them are crying. indian civil services are angry that govt has not taken decision to correct anamoly of pay between IAS vs other civil services. despite 6th pay recommendation of giving only marginal higher pay in 3 grade pays at Senior, JAG and selection selection to IAS and then it is uniform. coimmittee of IAS has wilfully made grade pay equal while introduced 2 additional increments at each scale which means 6 increment ahead . it is serious thing . PM is also not aware. Date of Birth : 1st July, Retires on 30th June , No increment after serving 365 days in calculation of pension and retirement benefits - a clear ANOMALY. For a person with official date of birth as 1st July, he retires on 30th June. He will NOT get increment after working for 365 days from the date of getting his last increment. Is it not an anomaly. (Also he will NOT be considered for promotion on 1st July as he has retired on 30th June). By giving a notional increment for retirement benefits and calculation of pension , this anomaly can be solved. It may be noted that if official date of birth is 2nd July, he retires on 31st July and in case of official date of birth as 1st July, he superannuates on 30th June. In many cases, official date of birth is different from real date of birth to get admission in school without losing an academic year. Also, time of birth is not recorded in office records. If the date of birth is mid night 12:30 or so of 1st July (early hours of 2nd July), many parents register it as 1st July , while some others register it as 2nd July. Either Government should consider notional increment for awarding pension for people retiring after January or retiring in June or at least for those with date of birth as 1st July. As per feed back of National Anomaly Committee meeting it is said that "after prolonged discussions, the Secretary, DoP&T had agreed to review the matter. An indication has also been given that if Staff Side agrees for one time exemption, then the issue can be resolved." We all affected parties request that this issue may take up strongly and consider it sympathetically and issue orders for one time measure. Why this matter could not be discussed even after 3 years. This matter is very obvious that SAME WORK SAME PAY supported by constitutional articles and Hon'ble Supreme Court decisions from time to time. There should be same entry level pay for direct recruits and promotees. Government why creating distinguish between direct & promotee even both have same work. It is also wrong to say that when a direct person appointed on post in same gradation list then promoted person stepped up to direct recruits. But what about its service benefits before this and why he deprived of pay till direct appointment in his office in same cadre. Also there are many departments(e.g.,IA&AD) in which a post(AAO) with both of direct and promottee exists with same work but in its sub offices some have no post of direct recruited person in same gradation list but on the other hand in other sub office direct recruitee post exists and promotee stepped up after appointment of direct, but those deprived of where no direct sanctioned post although there are same work, i.e., anomaly within a department .So please draw common view that EACH GRADE PAY HAVE IT'S OWN MINIMUM/ENTRY LEVEL WHICH PROVIDED BOTH TO DIRECT & PROMOTED. ALSO I humbly request MR. kUTTY Sir BEING OUR REPRESENTATIVE PUT IT STRONGLY BEFORE ANOMALY COMMITTEE. I hope that this issue may be soloved in next meeting and all suffers can be benefited and get their rights. i want clearification on point no 43 regarding LIBRARY and Information Asstt what the respected ANAMOLY COMMITTEE has decided in respect of LIA cadre .PL clear what they has decided,Anybody knows? pl pl pl clear it. It is a matter of great regret that despite clear orders, the Junior Translators/Junior Hindi Translators have not been given the Grade pay of Rs. 4600/- in pursuance of OM dated F.No. 1/1/2008-IC read with even No. OM dated 24.11.2008 & dated 27.08.2008 by several departments. The officers on this post are deprived of their legitimate rights. Such grave inaction is absolutely arbitrary and invites unwarranted litigation. Respected JCM Members should look into it and ensure the legitimate rights to the Jr. Translator/Junior Hindi Translators. It is always good to extend retirement age to 62 years because experienced personnel are sent out early when they are able to preform to their utmost efficiency(at 60).Moreover, a huge amount is being spent by the government towards pension without in put.Life expetency is also increased.Western countries are following this priciple. To compensate, recruitment age limit proportionate to retirement age should also be increased for young lot. sir, It is regret that even after 3long years the anomaly(ies) are yet to be resolve. 6 CPC's most arogatic recommendation is mearger of 3 scales (5000,5500 and 6500) into one or rather 2 grade has hampered a lot of employees. A lot of field officers are fall under this categories. It has not only hamperd on grade pay but also on entitlement of TA/DA. One should not wonder if it procceds till 7th CPC. Jai ho NAC !!! Please read the case and give reply with relevant orders if any. I am drawing pay of Rs 12470 as on 01.01.2006 and grade pay of Rs 4800 with DNI 01-07-2006. As I am in the grade of Rs 4800 since Jan 2006 I was given increment in July 2006.
my pay is stepping up to my Junior in 7Jan. 2006 and the increment given to me in July 2007, as I am drawing grade same grade for six months? Or Whether my increment has to be post poned alongwith my junior i.e. to July 2007? It is necessary to resolve the issue of grant of one increment for those whose increments fall between February and June 2006 on the same lines as those whose increment fell on 1st January 2006. Already 5 years passed and many employees retired. When DOPT will resolve this issue? Will not early decision to grant the same help in avoiding clerical work in refixing the pension? there is a simple method also. after fixing the pay scale on 1.1.2006 or at the time of joining. give pro rata increment upto july 1st for the first time irrespective of dated of joining.Then there will not be any anamoly for any body. SINCE GOVERNMENT REPRESENTATIVES IN THE MEETING ARE NOT AGREEING ON THE SUGGESTIONS MADE BY EMPLOYEE'S REPRESENTATIVES ON THE ISSUE OF INCREMENT FOR THOSE WHOSE INCREMENT DATE FALLS BETWEEN FEB TO JUNE. THEY HAVE VEHEMENTLY AND SEEMINGLY ARROGANTLY REJECTED THE SUGGESTIONS AND DEMAND. THE EMPLOYEES ASSOCIATION SHOULD START LEGAL COURSE AT THE EARLIEST SINCE ALREADY 5 YEARS THE WATER PASSEDTHROUGH THE BRIDGE. REJECTING ANNUAL INCREMENT FOR 17 MONTHS IS AGAINST THE NATURAL JUSTICE. DELAYING ANNUAL INCREMENT IS THE FORM OF PUNISHMENT IN GOVERNMENT SERVICE; AND EMPLOYEES WHOSE INCREMENT FALLS BETWEEN FEB AND JUNE ARE PUNISHED WITHOUT ANY WRONGDOING. ON THE CONTRARY EMPLOYEES ARE AWARDED BY GIVING ANNUAL INCREMENT IN SPAN OF 6 MONTHS WITHOUT DOING ANYTHING EXTRA. IS THIS A JUSTICE. THIS SEEMS LIKE CHILDREN DECIDE THEIR POLICIES IN WHILE THEY PLAY THE POLICYMAKERS ARE MAKING POLICIES WITHOUT APPLYING ANY MIND OF THEIR. AND DEFENDING IT MORE VEHEMENTLY. The third meeting of anomaly committee of 6th CPC held on 15th Feb 2011 has clarified the doubts on merger of pre-revised pay scales vide para 2 of item no 41 of the minutes said meeting that “Posts in the pay scales of ` 5000-8000/- & ` 5500-9000/- have been merged and no promotions can take place between the pay scales of ` 5000-8000/- & ` 5500-9000/-”. Therefore, it is very clear that the pay of employees who were drawn less pay than ` 5500/- in pre-revised pay scale of ` 5000-8000/- as on 01 Jan 2006 should be fixed at the minimum of ` 10230/- (ie ` 5500 *1.86) according to the pay fixation table the pre-revised pay scale of ` 5500-9000/- instead of pre-revised pay scale of ` 5000-8000/- to get the merger benefit to the employees in terms of FR-23 (6) (2) which says “ In case where the minimum pay of the revised scale is higher than the pay drawn by the Govt servant in the old scale, his pay will be fixed at the minimum of the revised scale ”. In view of the above, I request to the anomaly committee to consider this issue in the next meeting and also issue order to implement at the earliest not only to get benefits to the affected employees but also it will help to resolve may pending stepping up cases. What is latest news for retirement age 62 ?Is on 15 Aug 2011 prime minister will announced in his speech to raise the retirement age 62? Now days many departments and ministies are reducing the strength of group C and Group B, which is directly affecting the employment avenues of youth of india and also more work load on the remaing staff. the policy should be adopted that, the ratio of Group A:B:C should be at least 1:2:4.
can some one told me when the 4th meeting of natioal anomaly commitee will hold. Has the government as well as our unions forgot the issues left unresolved . it seems govt has no interest to look into the matter of genuine issues like issuue of DNI from feb to june.It is regretted that government has not resolved the case of individual’s whose annual increment falls between Feb 2006 to Jun 2006. This is a great loss to the individuals without their any fault. It is also intimated that State Governments have also implemented pay commission on the same line as announced by Central Government but they have fixed two increment dates on 01 Jan and 07 Jul .in my openion it is best possible solution which does not left any anomaly behind it. My wife joins a govt. organisation on 22 Jun 2007 with a Rs. 9300 as basic pay in the pay scale of 9300-34800 with grade pay of 4200. Then she again gave examination and appointed in the pay scale of 9300-34800 with grade pay of 4600 wef 10 Nov 2010. She resigned from earlier job on 09 Nov 2010 and joined new unit on 10 NOv 2010. She was given the basic pay of Rs. 10560 and grade pay of Rs. 4200 which was raised to 4600 in the month of Sep 11 with arrears. Now my question is that this type of job change is called fresh recruit or promotion? Further, whether she is entitled for pay in pay band i.e. Rs. 12540 as basic pay wef 10 Nov 2010? when will be the next meeting of national pay anomaly committee. when the issue of G.P. and one incriment for those who get promoton in the same G.Pay will be resolved is the commitee waitng for next pay commission as about 6 years out of normal course of 10 years of next pay commission has already over . i think govt should sit next pay commision only for classiII,III and IV employee shuld constituted immediatly if the anomaly commitee is not able give the same as got by class I officers in sixth pay commission report.